Fast store is better than slow. Ensure users with the flawless store performance. Important: starting in July 2018, page loading speed will become a ranking factor for search engines. Why use a cache warmer? Magento 2 is fast and well optimized for high loads. It offers full page caching and Varnish out-of-the-box. However, there are still a lot of things to be done to make your store as fast as possible. In fact, the store cache is frequently cleared due to a great number of reasons starting from page content updates and ending with cache lifetime expiration. Therefore, to timely cache all necessary pages and provide customers with ultimate shopping experience you need a tool which automatically warms the cache and ensures fast pages load. To automate the cache warming process and make it invisible for customers, we’ve developed a special Warmer tool to request pages with outdated cache during the night, when the number of site visitors is minimal. Due to the user-friendly interface and feature-rich functionality, the module can be configured literally in minutes. Simply set up the extension according to your needs and cron will do the rest! As the result, you can see the Warmed Pages Report. How does the Cache warmer work? The Magento 2 Full Page Cache Warmer carefully sorts site pages selecting the ones that should be cached first of all and adds them to a special cache warming queue. Once the queue is generated, the cache warmer starts processing it using cron. The pages are generated emulating multiple parameter combinations and then cached. With the extension a store admin can easily generate a cache warming queue in accordance with the set parameters to keep the cache on the most popular pages warm. sitemap XML and Text File together. Extension settings let you warm the cache of specific pages. 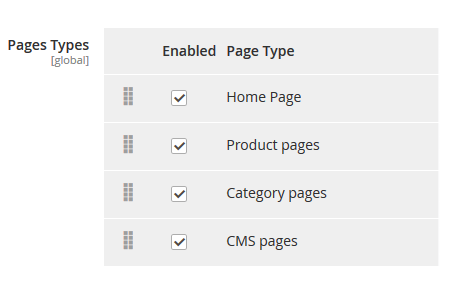 Simply specify the pages you need to exclude, thus taking cache warming process over total control. The XML sitemap automatically created with Magento 2 XML Google Sitemap extension improves the ranking of your website in search engines and befits the Amasty Full Page Cache Warmer for creating the URL queue. Schedule cron job to generate the cache warming queue depending to your needs. E.g. Run cron every 12 hours. Specify how often the crawler should process pages added to the cache warming queue. Set the max number of pages for the cache warming queue. As soon as the cache warmer processes page URLs in batches you can specify how many URLs a batch should contain. 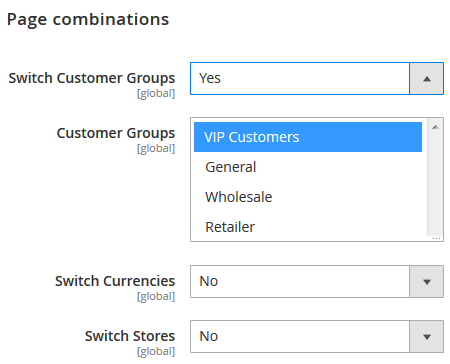 You can specify either one or multiple values for each chosen parameter. Due to this handy option all URLs of newly created or updated pages will be automatically added to the warmer queue. For example, you edit a product's name or a price and then save changes. Once the product is saved the cache warmer will instantly make the cache for it. Effectively monitor cache warming processes with an informative log grid. Crawled pages are automatically added to the log file together with related information like date, store view, currency, time etc. With the extension you can check whether the cache warming tool works correctly by using a debug mode which shows cache statuses and hints. The option perfectly works on the staging environment with native Magento cache. On the production environment when the Varnish cache is on, the module won't be able to gather and process necessary info. Therefore, the Status & Hints option won't be available. The order of links in the file is the order of their crawling. Read the full answer to get more information. We use Magento 2.2 with a custom theme and several extensions. With this module pages are cached and loaded very fast. The tool itself is simple, though at the beginning u can have some questions with configurations as we had. The support team was quick to answer and resolve our case, so that wasn't actually a problem to run the module correctly. We considered several alternatives and chose amasty. There are cheaper options, but fpc is worth every penny. After installation, our store works much-much faster. Also, if you need help, the support team is quick to answer. After migration to Magento 2, I bought the extension and came across a crawler queue issue in Magento 2.2. However, the guys fixed it soon and now I'm totally satisfied with the module. I don't need to clean cache manually every time I make changes, the debug mode shows cache is warmed where needed. So, it wasn't a waste of money. Fpc is really easy to install and configure. Actually, you can leave the default configuration and set the cache to work. What's more, the support team replies really fast. We had some questions after the installation but they answered to them all in a minute. Either way, the extension works well and the load speed is much faster now. Though, Memcache is not fully supported by the fpg. – New: the new type of the available Query Generation Source was added - 'Sitemap XML and Text File together'. Both the sitemap and the text file will be used for creating the URL queue for FPC warming.